VoIP has revolutionized telephony and changed the way organizations and contact centers communicate with their customers. The cost savings, expanded communication channels and easy installs are just a few of the reasons why there is a movement to VoIP infrastructure and SIP connections. NEC’s VoIP Call Recording solution, dvsAnalytics Encore®, is a comprehensive recording and quality management solution which records calls in all IP environments, making Encore VoIP call recording both simple and cost effective. It provides enterprises and contact centers with a software-only, easy-to-use recording solution that ensures compliance, improves productivity and enhances the customer experience. Sales Sheet Encore VoIP call recording provides many specific advantages, including: Multiple IP Recording Configurations - In the world of the new IP contact center, you can choose to record on either the trunk or station. dvsAnalytics’ Encore® Technology Suite supports both SIP Benefits of Encore VoIP Call Recording trunk-side and VoIP station-side (subscription and port mirroring) recording. Since trunk-side and station-side recording capture different elements of a call, it is important to know what calls your organization needs to record. For instance, do you want to record all conversations including calls to and from people outside the organization as well as internal conversations between employees? Or, do you want to record calls into your IVR, ACD messages (such as proving that the message is playing “this call may be recorded for quality purposes”), as well as calls that are forwarded to cell phones? Use the table below to select the right recording method for your organization; ultimately, one that will provide you with the data you need to quickly evaluate, analyze and improve the multimedia interactions within your organization. SonicView Call Recording & Reporting is an enterprise-grade call recording platform available at very affordable price points. It provides the most comprehensive call recording features and functionalities found in the marketplace today. SonicView can be configured as a trunk-side or a station-side call recording platform . SonicView trunk-side supports T1, PRI, Analog and SIP trunks and is PBX agnostic, making it a future-proof investment. SonicView station-side recording supports digital, analog and IP phones. Whether configured as trunk-side or station-side, it provides the same interface. 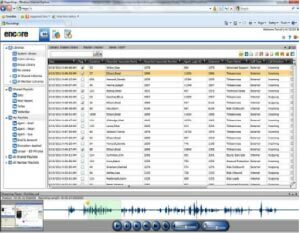 SonicView provides a user-friendly, Web-based interface making it easy to access recordings from any PC located on the network without needing to install any proprietary client application. It is built using the latest application architecture and provides a state-of-the art user interface to improve ease-of-use and enhance user experience. Centralized call recordings from multiple PBX/locations. Enhanced search and replay capabilities based on date/time, duration, extension, caller ID, dialed number, notes, flags etc. SonicView also offers a Call Scoring and Agent Evaluation module. This allows businesses to create various scoring templates and evaluate calls based on these templates. Once scored, the system would allow running various reports in order to evaluate agent’s performance over a period of time or across multiple agents / departments. Can be used by different functional managers, such as quality assurance managers, sales managers, support managers, compliance managers, etc.